As part of my new monthly resolution I am trying to get hubs more interactive with the boys on the weekend. We have decided to bring then roller blading or bike riding at the park. Last weekend was a blast. We have been going to different parks every weekend to spend a fun filled afternoon with the kids. We are blessed to have so many different parks with a large playground section around. 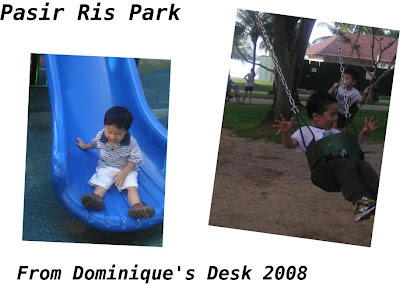 On Saturday we visited the Pasir Ris park as I wanted to let the boys go on the pony rides available there. We didn’t go to the pony section but ended up at the playground instead. The boys went wild at the slides and swings. There were plenty other slides and even a 3 storey spider web to climb but they were for older kids and we had to give those a miss. 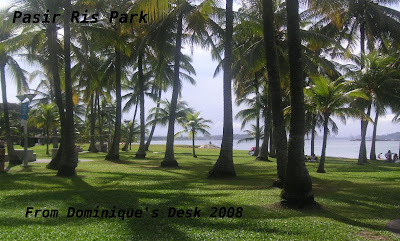 Being a park by the sea the view was breathe taking. 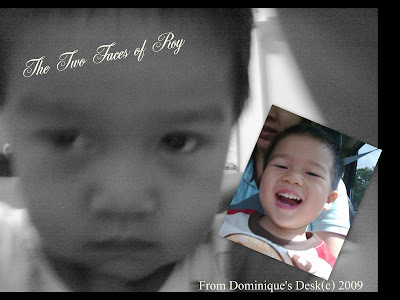 It was a pity that I do not have a D80 or similar camera or I certainly be able to take nicer photographs.